The Zamoskvoretsky Court of Moscow has convicted Russian opposition activist Alexei Navalny of money laundering and fraud in relation to the Russian subsidiary of the French cosmetics company Yves Rocher and the Multiprofile Processing Company and has given him a suspended sentence of three years and six months. Alexei Navalny's verdict was read out by Judge Yelena Korobchenko on Tuesday, an Interfax correspondent has reported. The court also ruled that Navalny would stay under house arrest until his suspended sentence came into force. Navalny was also ordered to pay a fine of 500,000 rubles. Last year, Navalny received a five-year suspended sentence for the theft of 16 million rubles from the Kirovles timber firm in 2009. The Navalny brothers were accused of having fraudulently stolen over 26.7 million rubles from Yves Rocher Vostok and over 4.4 million rubles from the Multiprofile Processing Company, according to the preliminary inquiry. These funds were subsequently legalized by transferring them to Kobyakovskaya Fabrika Po Lozopleteniyu, controlled by them and their relatives on fictitious grounds, the Russian Investigative Committee said earlier. 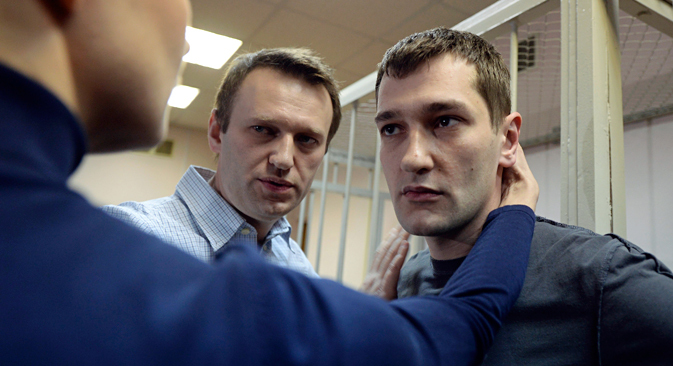 Alexei Navalny was given a suspended sentence in the Kirovles case. On July 18, 2013, the Leninsky district of Kirov sentenced him to five years in prison for stealing from this enterprise. However, the following day he was released on travel restrictions until the effective date of the verdict. On October 16, the Kirov regional court replaced the prison term with a suspended sentence. Navalny came in second in Moscow's mayoral elections in September 2013 with 27 percent of the vote.